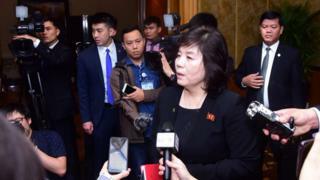 Vice Foreign Minister Choe Sun-hui told foreign diplomats the US threw away "a golden opportunity" at a recent summit between President Trump and Mr Kim. "We have no intention to yield to the US demands in any form, nor are we willing to engage in negotiations of this kind," she told reporters in North Korea, Russia's state Tass news agency reported. She accused the US of taking a "gangster-like" stance, according to the Associated Press, but added that "personal relations between the two supreme leaders are still good and the chemistry is mysteriously wonderful". Ms Choe said that North Korea's demand during the recent summit was for five key economic sanctions to be lifted, not all sanctions, as Mr Trump said after talks broke down. "It was all about the sanctions. They wanted the sanctions lifted in their entirety and we couldn't do that," Mr Trump told reporters. "Sometimes you have to walk and this was one of those times," he said. In Washington this week, the US special representative for North Korea, Stephen Biegun, said that diplomacy was "still very much alive", though he did not say if there had been any negotiations since the summit, or outline any plans for further talks. At a news conference after the Hanoi summit, Mr Trump said no plans had been made for a third summit, but he expressed optimism about a "good outcome" in the future. So does this mean a return to "fire and fury"? Not quite. North Korea's tactic might be to hope this will initiate a reaction from the US. Pyongyang is aware that Donald Trump has boasted about his ability to get Mr Kim to stop firing missiles and testing nuclear missiles. "As long as there's no testing," said Mr Trump, "I'm in no rush." North Korea also has hardliners of its own, who may perceive Kim Jong-un's 120-hour train trip to Hanoi and back as a failure. This announcement lets them know, along with the Trump administration, that Mr Kim is standing firm.